BREAKING NEWS: DNA MONTHLY IS ENTERING ITS ELEVENTH YEAR! I never could have imagined, when I began this ezine a decade ago, that someday I would write that DNA Monthly, your FREE online resource for cutting-edge news about who you truly are, is entering its eleventh year! It just goes to show that time flies when your DNA is activating. I wish to take this opportunity to thank new and long-time readers alike for your support. I also call your attention to our wonderful selected Archives. 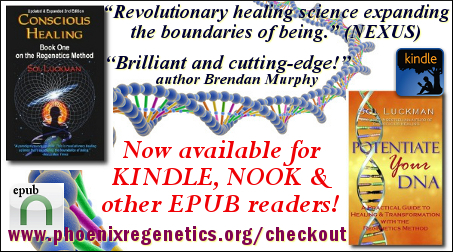 The current jam-packed issue of DNA Monthly, perhaps our best issue ever, is just a taste of the healing, empowering and transformational material coming your way from the Phoenix Center for Regenetics in 2015. 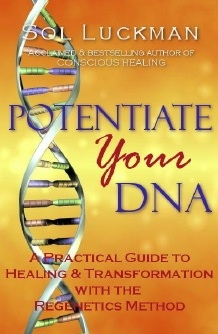 Stay tuned for (at long last) the Spanish language edition of the bestselling Potentiate Your DNA, audio recordings from the bestselling Snooze: A Story of Awakening, and much, much more! Enjoy this fantastic issue—and to your potential in 2015! The natural properties of biomolecular structures enable cell components and whole cells to oscillate and interact resonantly with other cells. The cells of the body and cellular components possess the ability to function as electrical resonators. 1. Biological reactions to atmospheric electromagnetic and ionic disturbance (sunspots, thunderstorms and earthquakes). 6. How techniques such as acupuncture, moxibustion and laser (photonic) acupuncture can result in healing effects and movement of Chi. 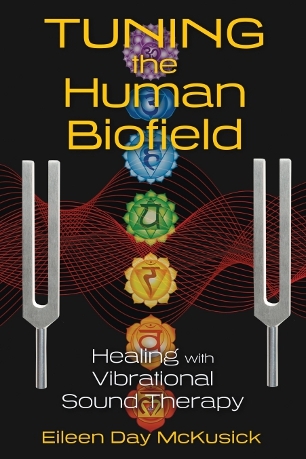 Sound Balancing is a therapeutic method that makes use of the frequencies produced by tuning forks to detect and correct distortions and imbalances within the biomagnetic energy field, or biofield, that surrounds the human body. It is a process that has been evolving since I first picked up a set of tuning forks and began incorporating them in my massage therapy practice in 1996. The sound acts like sonar—it bounces off the structure of the body and the field and comes back with information. Over the years, I learned to interpret this information, which led to what I call the Biofield Anatomy Hypothesis. The Biofield Anatomy Hypothesis is the premise that our biofield—which extends approximately five feet to both sides of the body and three feet above the head and below the feet and is shaped like a torus—contains the record of all of our memories, embedded in standing waves within this structure. It is what we might call our mind, both conscious and subconscious. Just as the brain is compartmentalized with different areas responsible for different functions, so is the biofield, with specific areas holding information related to specific emotions, states of mind, and relationships. In addition to our memories, the biofield contains the blueprint that the physical body organizes itself around. I encounter two fundamental phenomena in my work in the biofield, which I refer to as energy and information. The information is the record (memories) of everything that has occurred in a person’s life, laid down on the torsion or aetheric level in what I perceive as standing waves. The energy is the charge or resistance associated with those memories. These charges appear to relate to a trauma in a person’s life. Periods of trauma, whether mental, physical, or emotional, often recede in time and space without ever being completely processed by the person. These memories seem to live on as charged incoherent oscillations, or noise, within the biofield, exerting a nonbeneficial frequency pattern within the person’s body and mind. These areas of resistance have corresponding areas of tension or lack of flow within the physical body, and as a consequence, over time, they can cause breakdown in the order, structure, and function of the physiology (i.e., entropy). This apparent resolution of incoherent oscillations and integration of the charge associated with them back into the body is a process somewhat similar to the shamanic practice of soul retrieval. Shamans say that during a traumatic experience, parts of the self get split off and left behind in the past. 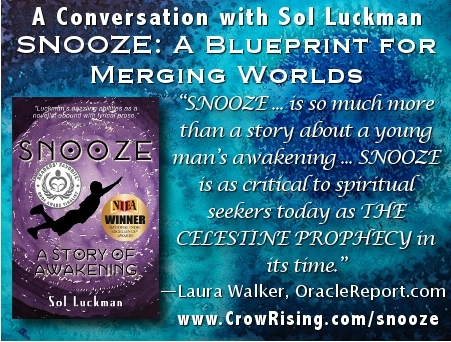 The shaman enters into a trance state in order to locate and restore these lost pieces. When I first began employing the click, drag, and drop method within the field, I called it sonic soul retrieval. The outcome of locating, de-differentiating, neutralizing, and integrating these disturbances in the biofield can be immediate and profound, on all levels of functioning. Using sound this way in the biofield allows us to locate traumas at their source point in the historical record. For example, one client, a woman in her forties, had the experience of debilitating anxiety her whole life. She had been to various psychiatrists and been on and off meds, but had not found any relief from her symptoms. Within five minutes of having her on my treatment table, I was able to determine that she had had a very traumatic birth. I located a highly discordant and charged energy pattern at the outer edge of her biofield off of her right knee (an area that relates to “obstacles to moving forward”). A coherent frequency, such as that produced by a tuning fork, inserted in this precise location, gives the body the opportunity to resolve the incoherence, modulate the distortion, and settle itself down. Returning the following week, the woman reported that her anxiety had diminished by about 75 percent and noted that since she now understood the origin of the feeling, she was less upset by it when it did arise and that it moved through much more quickly. These sorts of immediate and profound outcomes are very common in Sound Balancing, which has also been used to successfully treat not just anxiety but also pain, depression, PTSD, digestive disorders, vertigo, and much more. Using sound through the biofield to change the way the body expresses itself, from dysfunction to function, whether through DNA, emotions, or physical functioning, represents a profound leap forward in the way we approach healing. Sound Balancing can also be performed at a distance. This is a rather curious experience that begs for an explanation. How can a sound session performed in my office in Vermont affect a body in another part of the world? Interestingly, the energetic patterns that show up around a body in what I call the bioplasmic biofield appear on my treatment table exactly as if the person were really there. I am able to determine, with great accuracy, the periods of stress in a person’s life, the quality of their relationship with and personality of their parents, whether they have spinal subluxations and where they are, if they have ever received a concussion and at approximately what age, the status of their digestive processes, and much more. Additionally, I am able to effect change on these levels, at a distance, through sonic manipulations of these energetic patterns. The answer to this mystery may lie in the concept of aether—the deep, connective, holographic medium that is present everywhere throughout the universe, though missing from our contemporary cosmology, which subscribes to the modern notion that aether was disproved in the late 1800s. While the term aether has been tossed out of our popular lexicon, the phenomenon persists, and has been given a great many other names, including the zero point field, the source field, the torsion field, the field, and, more recently, the Higgs field, whose definition, “an invisible energy field that exists throughout the universe,” sounds an awful lot like the definition of aether. Information travels through this medium at much faster than light speed, or perhaps even instantaneously due to its holographic nature (meaning the information of the entire field is instantaneously accessible at any point). This holographic quality can potentially explain the mechanics of how distance healing works. Just as I can place my awareness now in my left foot, now in my right hand, with no sense of that awareness having to travel in a linear way through my body, so I can place my awareness on a client 1,000 miles away and use my subtle energy field to influence it at a distance. Numerous experiments have been conducted that demonstrate that qi gong masters using a form of energy healing originating in China can create healing in one petri dish versus another over great distances, with tremendous precision. Whether we place our awareness in a specific finger of the body or a specific petri dish faraway, it is fundamentally the same action. But how does it happen? It has generally been ruled out that conventional electromagnetism plays a role, for several reasons. Healing has been successfully conducted in EM-shielded rooms, and over great distances instantaneously, which would not account for the time involved for EM energy to travel. For this reason, aether is concluded to be the medium through which this energy travels. However, I have read that in EM-shielded rooms where there has been a biophoton multiplier, an extremely sensitive device that can count the number of biophotons (quanta of low intensity visible light) being emitted by a life-form, “bursts of biophotons” have appeared while the distance healing is being conducted. As the nonlocal interconnective medium that unifies us all in real time, aether is the missing link in so-called paranormal phenomena such as remote viewing, distance healing, synchronicities (i.e., meaningful coincidences), and telepathy. That we can use sound and intention in this instantaneous and powerful way, both locally and at a distance, intimates profound possibilities for healing and expansion of human consciousness in ways that we have yet to fully imagine. Copyright © Eileen Day McKusick. All Rights Reserved. Eileen Day McKusick has researched the effects of audible sound on the human body and its biofield since 1996. She has a master’s degree in integrative education and is currently pursuing a PhD in integral health. She teaches privately and at Johnson State College and maintains a sound therapy practice in Stowe, Vermont. Visit her website at www.eileenmckusick.com. Using holographic technology combined with sound healing to heal energy distortions in the body is an energy healing technique that will one day revolutionize the medical industry. This revolutionary energy healing technique utilizes sound waves, frequencies, and light to heal the deeper systems of the body, such as the cell, the DNA, and the energy system. In theory, a well-built holographic healing device and sound healing generator could produce healing light and frequencies to heal cells and DNA and stimulate the body’s energy back into a more balanced state. These types of health technologies have great healing potential, but they can also be used to harm the body. Because of this, when using these energy healing technologies to balance your energy, it is wise to make sure they produce light and sound that harmonize well with the energy of your body. One of the main reasons holographic healing and sound healing don’t heal the body as well as they should is because of our lack of knowledge of how to use the healing power of sound, resonance, frequency, and light to heal our body. This lack of knowledge prevents us from creating light and sound that resonate well with the frequency of our body. For more information about how light effects your energy, read this informative article: How Light Affects Our Energy & Health. Another reason why holographic healing and sound healing take longer to heal the body is due to the fact that these energy healing techniques target the deeper structures of the body. As a result, it takes longer for the healing effects to show up as physical symptoms. As more studies are done on the healing effects of sound and light, we will gain essential knowledge that will one day help us create sound and holographic technology that can heal cells back to their healthy state, or stimulate them to regenerate damaged tissues and lost body parts. In fact, some scientists already did some experiments that showed how the power of sound, resonance, frequency, and light could do these things. One of these scientists was Dr. Royal Raymond Rife, the inventor of the Rife frequency healing machine. 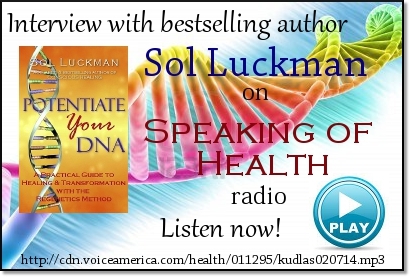 To better understand how sound, resonance, and frequency can be used to heal our body and regenerate lost limbs, we need to understand how morphogenetic fields, holograms, and DNA work at the fundamental levels. Below are a few paragraphs extracted from my book Staradigm about morphogenetic fields, holograms, and DNA. The external reality we experience in our daily lives is a holographic projection of consciousness or energy that is constructed through the use of thought. Because matter makes up our external reality, it is also a holographic projection of energy. This also means that our bodies are created the same way because they are made of matter. The fundamental definition of the human body is a system that is created through holographic projections of energy. The form and evolution of the human body is governed by its own morphogenetic field. This living thought form field acts like a template upon which matter is manifested. It also allows consciousness to create structure so that it can experience itself. A hologram is similar to a photograph but is three dimensional and multidimensional in nature. Within any point in a holographic image, no matter how small, all knowledge of the whole image is present. In other words, it has the potentiality of projecting the whole from which it emerged. If scientists dig deeper into the structure of DNA, they should be able to discover that DNA is the digital data imprint of the other living portions of our identities and is not bound to linear time and local space. They should also find out that DNA is the key to retrieving cellular memory because it allows our consciousness to become aware of experiences in other time continua. In other words, it can help expand our consciousness and perceptual field beyond three-dimensional space. If scientists start to understand how DNA truly works, they may even one day discover that DNA is one of the key elements that create our external reality. 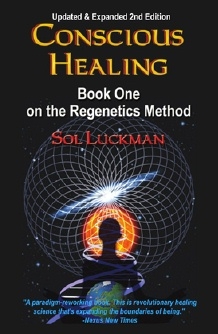 The next few paragraphs go more in depth about DNA, morphogenetic fields, holograms, resonance and frequency, and why they are important for healing the body or regenerating lost limbs. The following five paragraphs are published with permission from Academia.edu. Morphic fields are non-material regions of influence extending in space and continuing in time. They are localized in and around the systems they organize. When any particular organized system ceases to exist, its organizing field disappears from that place. But in another sense, morphic fields do not disappear: they are the potential organizing patterns of influence, and can appear again physically in other times and places, wherever and whenever the physical conditions are appropriate. When they do so, they contain within themselves a memory of their previous physical existences. The process by which the past becomes the present in morphic fields is called morphic resonance. Morphic resonance involves the transmission of formative causal influences through both time and space. Cells contain DNA and have the ability to work in harmony with other groups of cells to create blood, bones, muscle tissue, etc. The body can be seen as an immense electromagnetic field, which interacts in a still to be explained way with its morphogenetic field which unfolds formative influences by resonance. Each of us has our own unique resonant frequencies or our unique quantum hologram which acts as a “fingerprint” to identify our non-local information stored in the Zero Point Field. Since the event history of all matter is continually broadcast non-locally and stored in the quantum hologram, the quantum hologram can be viewed as a three-dimensional vista evolving in time which fully describes everything about the states of the object that created it. Not only do we each have our own unique quantum hologram, but it is also possible for others to tap into parts of it though resonance. The holographic part, which is a physical record of interference patterns in all fields, can give rise to an entire original image. This is key to regeneration employing stem cells. At the fundamental levels, our body is a hologram and therefore it is made of condensed light. But unlike tradition holograms, our holographic body is multidimensional in nature and has the potentiality of projecting the whole from which it emerged. All medical conditions of the body are the result of energy distortions in our holographic body. By learning how to fix these energy distortions using holographic healing techniques, we can heal our body at the energy level and therefore preventing energy distortions from manifesting into medical conditions. Sound also plays an important role for healing our body, because nature uses sound to organize matter into structures and sacred geometry. In other words, sound is one of the fundamental energy forces that nature uses to create life. At the fundamental levels, the structures of our body and its performance are heavily influenced by sound. For visual evidence of how sound creates sacred geometry and life, read this empowering article: Frequency & Vibration: How They Create the Structures of Matter and Life. Copyright © PL Chang. All Rights Reserved. PL Chang is author of Staradigm: A Blueprint for Spiritual Growth, Happiness, Success & Well-Being and author and founder of EnergyFanatics.com, where this article, republished with permission, first appeared. Yes, once when he was twenty, he woke up in the middle of the night and walked to his window and looked out over a city and knew he was on the cusp of an endless future … but what can he do about that now? There is no returning. Yet … if he took a chance, if he began to dream again, if he started up the engine, if he considered offloading the interlocking systems that have become his daily life, what might happen? The stories are messages … sent to ourselves, to remember. This place, this day, this moment is a platform from which to embark.